WHEN an LA fashion designer relocates to Andalucia you expect something special. And Casa Noble does not disappoint. The appropriately named townhouse in the heart of Aracena is a romantic retreat with style very much to the fore. Painstakingly renovated by Melanie Denny, originally from Australia, it has a wonderful balance of colours and fabrics, while also enhancing the very best of the historic building. The floors, doors and rejas are original and the designer has worked hard to use natural light to create a true sense of space. The bedrooms are vast, with incredibly good quality matresses and furniture almost all imported from America, while the bathrooms are impeccable. A massive foodie, Melanie takes great care in ensuring that not only breakfast, but lunch and dinner, in basement bar Obra, are as good as you would expect to find elsewhere in the region. Another charming townhouse option is Casa Oropendola – meaning Golden Oriole – a beautiful 200 year old townhouse in the tiny village of Castano de Robledo. Converted by Dutchwoman Susana, this charming home maintains all its original features, including hydraulic tile floors, a wonderful two hectare huerta/garden with its own well and best of all an unusual veranda, one of the nicest architectural features in the whole region. Good value and great for families, this is a superb base for walking and the town is slowly getting a name for being something of a foodie retreat, with a good range of restaurants. Another stunning place to stay is Finca La Fronda, which sits in an impossibly good location at the top of the scenic back road between Linares and Alajar. Run by former oil executive Charles Wordsworth and his son Alex, a dynamo of energy, this is a privileged retreat with perhaps one of the best sited pools in Andalucia. The views stretch for miles and the rooms are well appointed and nudge towards luxury. The backdrop is entirely green and the silence here is golden, with little to disrupt the peace. Down the hill you must look out for the highly original Posada San Marcos. One of Andalucia’s only completely carbon neutral places to stay, this is the second hotel of Angel Millan and Lucy Arkwright, who have been hosting travellers and walkers in Alajar for over a decade. Carefully renovated using the best quality wool and cork insulation, it also counts underground geothermal heating, which is one of the first in Andalucia. “It has certainly cost a fortune, but we hope it will eventually pay back,” explains Arkwright, a friendly Bolton lass, who has been described as the ‘Gerald Brenan of the 21st century’. With intelligent mattresses that mould to your back and a wonderful garden with a huge pool and trampoline for the children, this is a top option. Another excellent choice for the active traveller is Molino Rio Alajar which not only counts a fabulous pool, but one of the only tennis courts in the area, and perhaps one of the most scenic in Europe. Sitting in the heart of a sleepy valley, near Alajar, you arrive at the molino down an extremely narrow cobbled track, even driving over a ford. 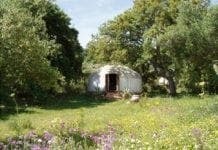 Few arrivals could be so perfect and once in, you will not be disappointed, with its sensitively converted cottages nestling seductively into the landscape and its owner Peter Jan sensitive to guests’ whims and issues. Keen walker Peter and his wife have spent the last year waymarking up to 10 local walks that go from the door and their knowledge of the area is second to none. 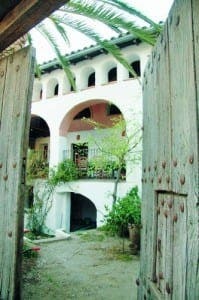 Last but not least, a trip to Aracena would not be the same without a night at the grand family retreat Finca Buen Vino. Set in 100 hectares of breathtaking mountain scenery, this beautiful renaissance-style villa counts – without a doubt – one of the finest swimming pools in southern Spain. The family home of the charming Chestertons for three decades, this is a working farm, which has its own livestock and vegetables. You are here though for the fabulous welcome you get from Sam, Jeannie and their children, when in residence, and the rooms are comfortable and full of books. Wonderful walks go right from the door to the nearby villages of Los Marines, Fuenteridos or Linares de la Sierra and there is normally someone able to pick you up if you need a lift home. Best of all you can stay in and have a wonderful three-course candlelit dinner – served in a wood-panelled dining room – created by either Jeannie or son Charlie, who trained at Ireland’s top cookery school, Ballymore. Why are we getting this constant stream of articles about Aracena but nowhere else in Spain? Hi there Chris. We see your point! The recent articles come from our Aracena supplement which appeared in issue 131. Through our pull-out travel sections (which in the past have included Gibraltar, the Axarquia, La Cala, and Sierra Nevada amongst others) we hope to give our readers a good idea of what to expect from these areas. However, we appreciate your comments and will take them on board. I’ve nothing against Aracena but I don’t get to see your print version, just what is included in the email newsletter. Perhaps mixing up the areas covered rather than having a blitz on just one is more appropriate for the online medium as opposed to a print supplement..? I think Ronda is sorely lacking in coverage.